The agamas or the Vedic literatures which describe the process of Deity worship in a temple recommend performance of Brahmotsava - a festival to commemorate the divine appearance of the Deities of that temple. Generally, this is a grand twelve day long festival. Devotees at ISKCON Bangalore celebrate the merciful appearance of the Supreme Lord as the Deities, Sri Sri Radha Krishna Chandra. The Deity of the Lord in the temple is non-different from the original Supreme Personality of Godhead, Lord Krishna. The devotees offer tasty foodstuffs, perform gorgeous aratis, decorate the Deities with gorgeous dresses, jewellery, flower garlands and so on. The devotees offer their humble prayers unto the Deity to keep them always engaged in His service. The devotees also reveal their minds in front of the Deity and the Deity of the Lord also reciprocates. These are the wonderful dealings between the Deities and the devotees. Srila Rupa Gosvami has also written a comprehensive literature on Deity worship rules. 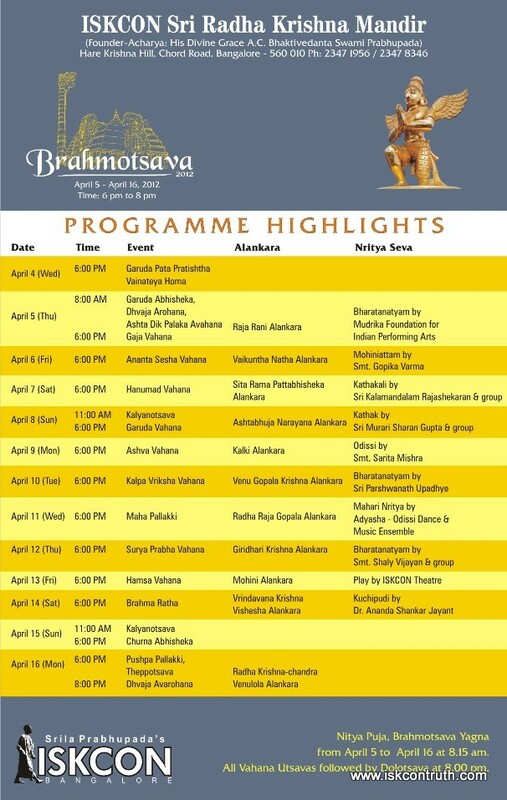 On the first day of the Brahmotsava, all the important demigods like Lord Brahma, Indra, Shiva and so on are invited to participate in the festival. A flag bearing the picture of Garuda is hoisted (dhvaja arohana). This indicates the commencement of the festival. 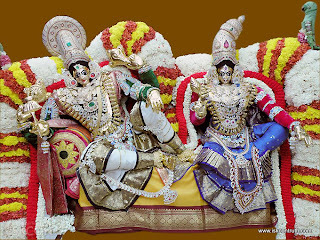 Every evening there is a gorgeous pallakki utsava. 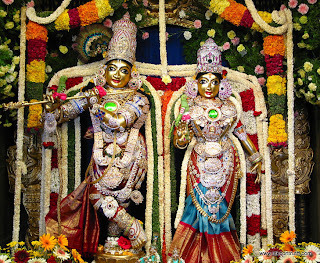 Everyday the utsava Deities of Sri Sri Radha Krishna Chandra are decorated in different alankaras. Each Pallakki has its respective carriers (vahanas), insignia carriers and the fan bearers. The Lord mounts the vahana and goes for a pleasure ride on His carrier, along with His eternal consort and other devotees just like a king goes out in his chariot along with his entourage. The Deities are carried in the particular vahana to suit the alankara He is wearing on that day. When He is adorned in the Suryanarayana alankara, His vahana is Suryaprabha vahana; and in His Seetharama Pattabhisheka alankara, His vahana is Hanumad vahana and so on. Various performances of traditional dance styles, depicting the pastimes of Lord Krishna, are enacted in the evenings for the pleasure of the Lord. After the cultural performances, the Deities receive dolotsava seva, during which the utsava vigrahas are swung on a decorated swing. Apart from these festivities, Brahma Rathotsava, Kalyanotsava and Churanabhisheka are also performed as part of the eleven day festival. During the Brahma Rathotsava, the utsava vigrahas of Radha Krishna ride on a chariot or ratha. Churanabhisheka is the ceremonial bath during which They are bathed in turmeric paste and other auspicious items. 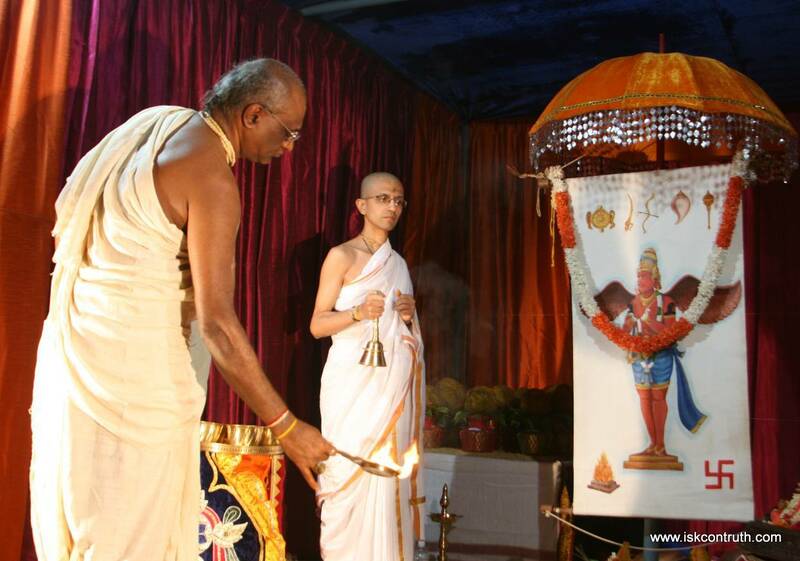 The festival concludes with the dhvaja avarohana - lowering of the flag of Garuda.